A place where we provide therapeutic massage and bodywork with a goal of bridging the gap between clinical treatment and a spa experience. If you are looking for a comfortable, unpretentious place to relax, address pain and injuries, enhance health and athletic ability, or just to improve emotional well-being, this is the place to be. 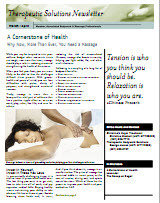 For centuries, massage has been practised as a holistic approach to wellness and healing and while it may feel like a luxury, massage provides a means of staying fit and healthy and helps us deal with the stressors which accumulate more and more frequently in our hectic lifestyles, impacting our health and well-being. Massage stimulates the immune system, increases circulation, reduces tension and anxiety, alleviates aches and pains, hastens recovery from injury or trauma, improves sleep, and can lower levels of chronic pain. It addresses the causes and effects of repetitive stress injuries, alleviates joint stiffness and increases the range of motion of muscles. Massage is a safe, non-invasive method of healthcare which leaves you feeling refreshed, renewed and better able to cope with stress and every day life. Why does “The road to wellness lead to YOU”? The road to wellness and sustained health is much more than just a therapeutic session or SPA treatment. Ultimately wellness centers on you, your lifestyle, environment, and the decisions one makes each day. We are here to assist in this journey by creating an environment and providing natural therapeutic care to assist you along the way. Fast and convinient appointment scheduling for new and established clients. Includes email / text notification and online changes.